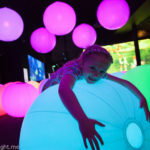 The Wiggles Exhibition at The Powerhouse Museum - Adventure, baby! 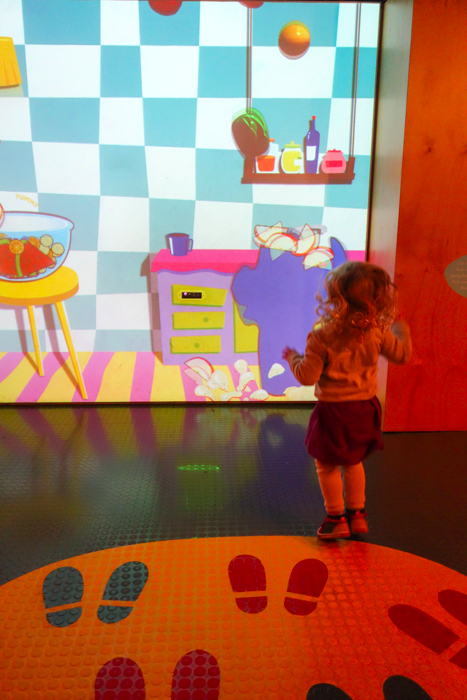 Having spent her entire life until recently in the US, Miss E had never experienced the phenomena that is The Wiggles until we took her to the new Wiggles exhibit at the Powerhouse Museum. It was a cold and miserable winter day and we were short on ideas to entertain her. 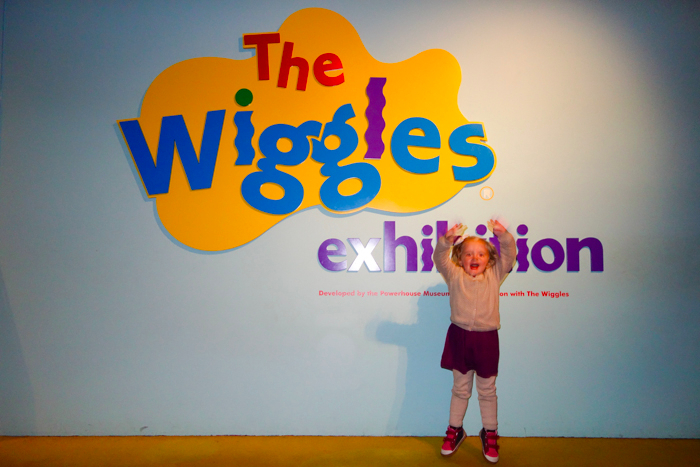 I was hoping that it wouldn’t matter that she didn’t know The Wiggles, and, thankfully, the exhibit was so good that she didn’t even noticed that it was based on characters she wasn’t familiar with. 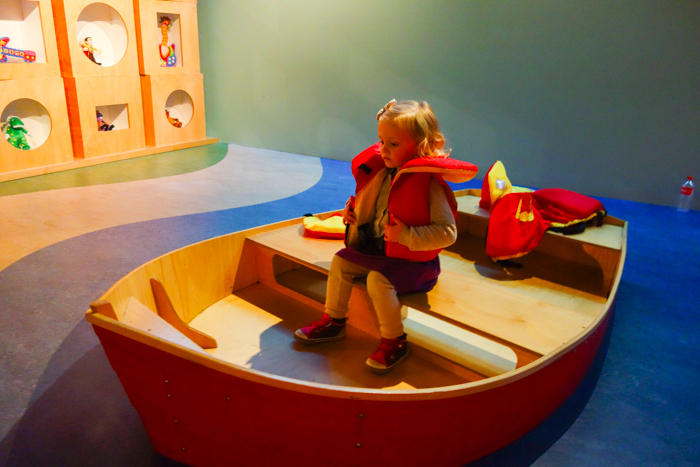 She just thought the whole thing was a giant play space, which certainly says something about how well the exhibit was designed with little kids in mind. 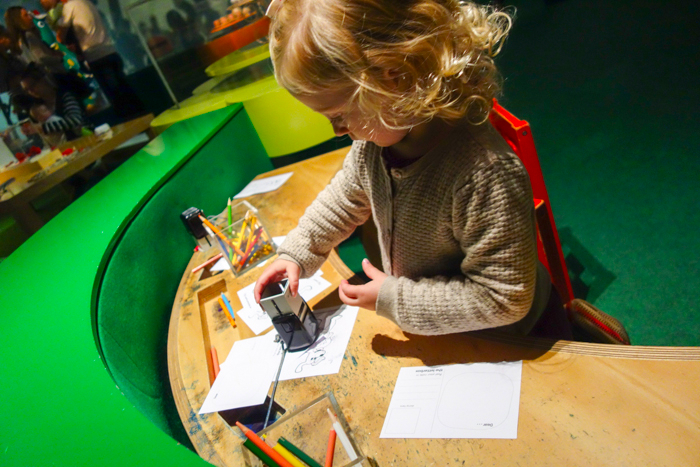 It was E’s first time at the Powerhouse Museum in general, and my first time visiting in years and years. 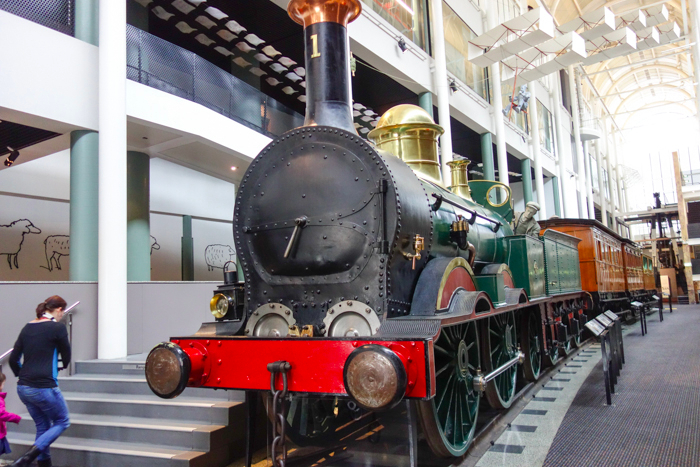 A special mention goes to the huge steam train inside the entrance — equally fascinating for kids and adults-alike. 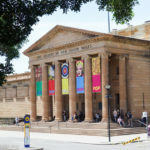 While, as an adult, I’ve never been particularly fond of The Wiggles, I’ve always been interested in them as they studied early childhood education at my university (Macquarie Uni!). 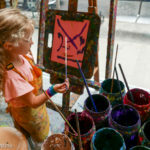 Part of their popularity I think can be attributed to the way in which The Wiggles structure their performances around how young children develop and learn. 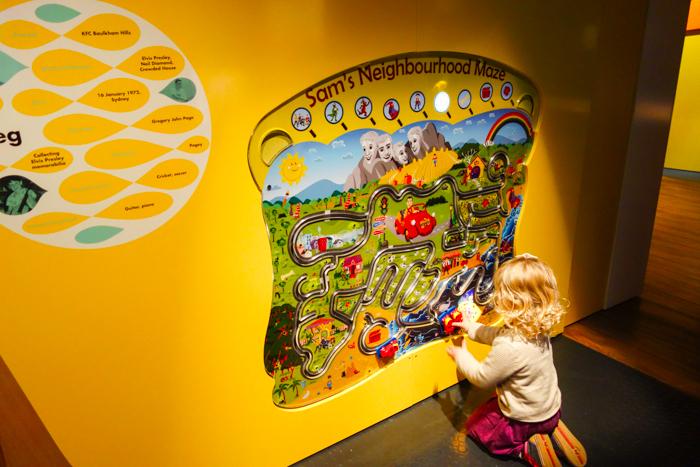 The Wiggles exhibition at Powerhouse Museum is carefully curated so that adults are (almost!) 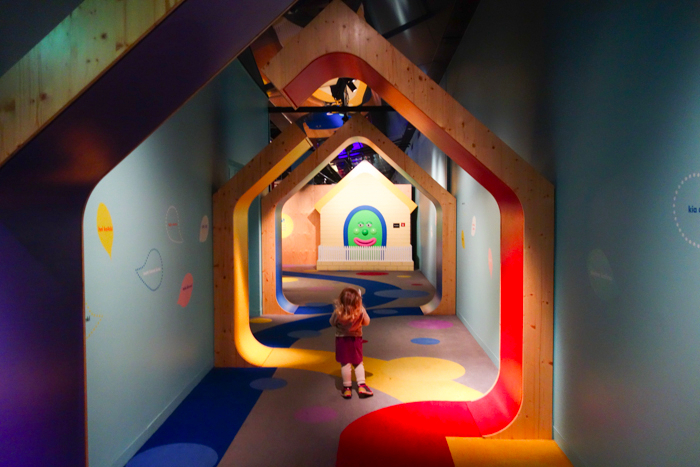 as entertained as children. 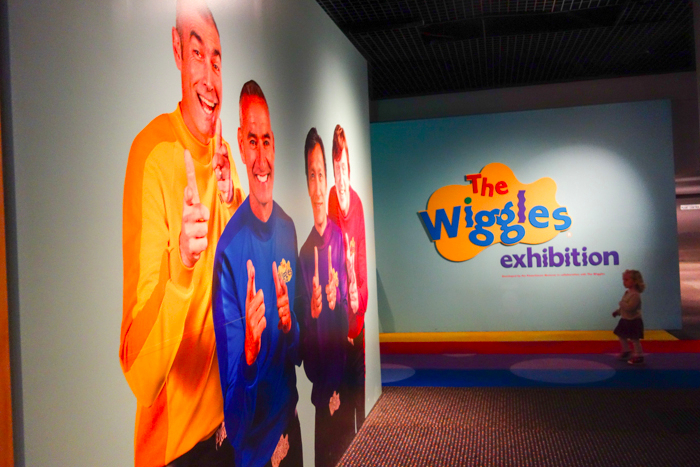 While we spent most of our time in the exhibit chasing around our kid, I was still able to read a few panels on the amazing rise of The Wiggles. 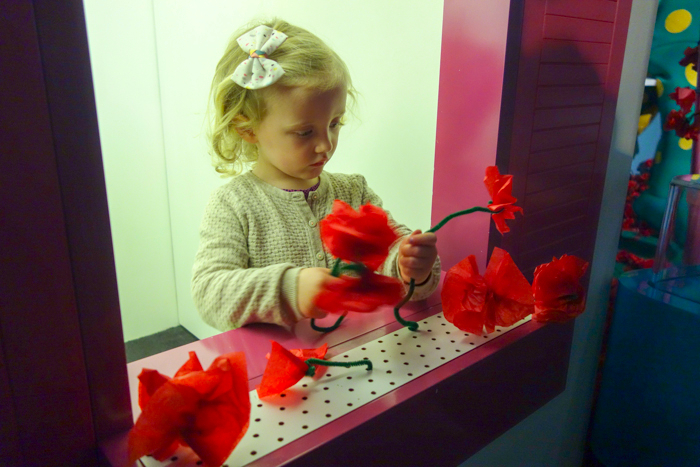 What we were there for, however, was to let little E play — and play she certainly did. 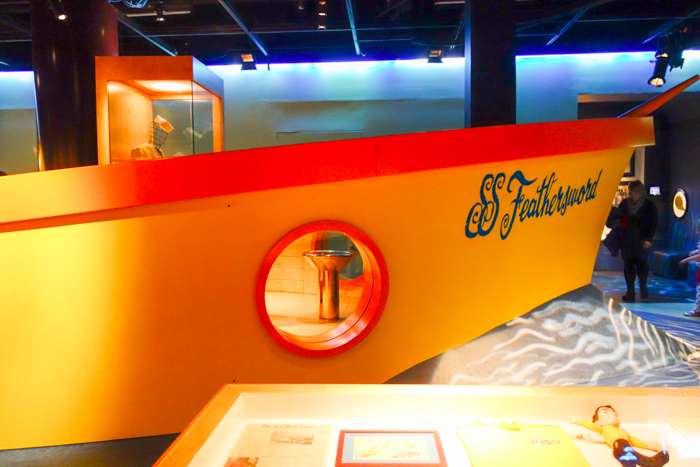 I was super impressed with the exhibit. 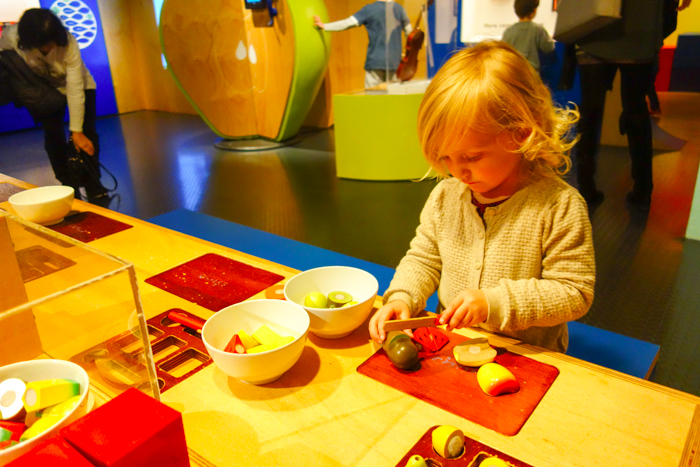 It had great high-tech interactive elements, such as what I can only call a life-sized game of Fruit Ninja (even Alec had a go! 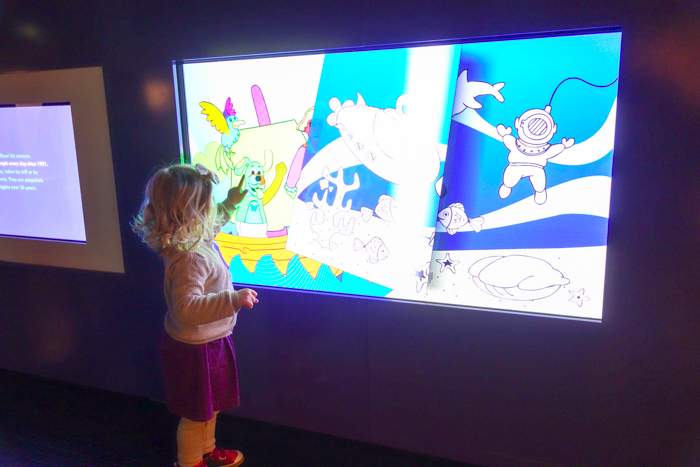 ), a touch-screen coloring book, a holographic performance by The Wiggles, and iPads with The Wiggles games on them (sadly only two out of the four actually worked when we tried them however). 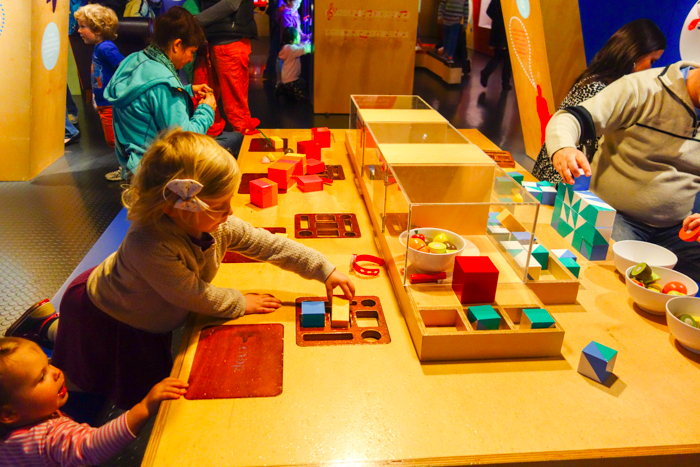 The exhibit also featured free-form play elements, such as Dorothy’s house with a tea party inside, a shape-sorting and fruit cutting table, and a pirate ship with telescopes, steering wheel and raft. 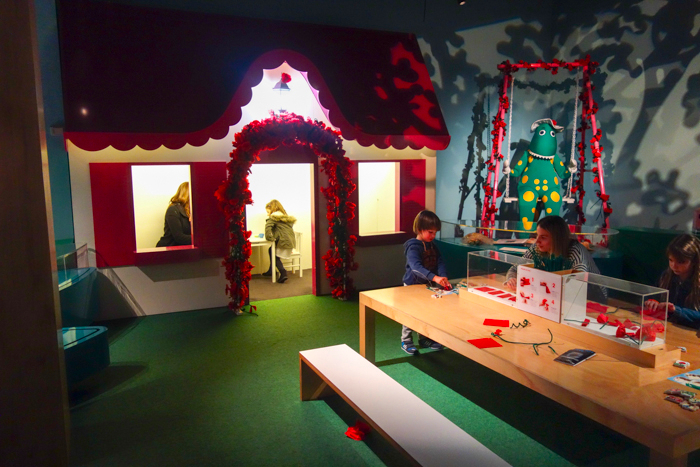 There were also a few arts and crafts stations, where kids could make a rose for Dorothy’s house, or write Dorothy a letter and post it to her. 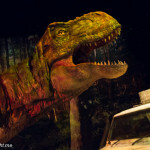 Kids who were clearly fans were delighted to see the life-size Dorothy the Dinosaur, Wags the Dog and Henry the Octopus. 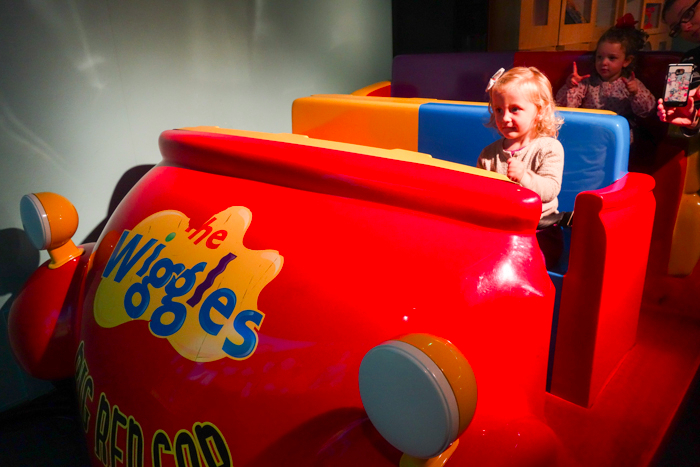 Since she was new to The Wiggles, E thought these huge creatures looked like a lot of fun and tried to hug them, which sadly wasn’t possible. She did however enjoy yelling “wake up Jeff!” to waken a sleeping Jeff character projected onto a screen. 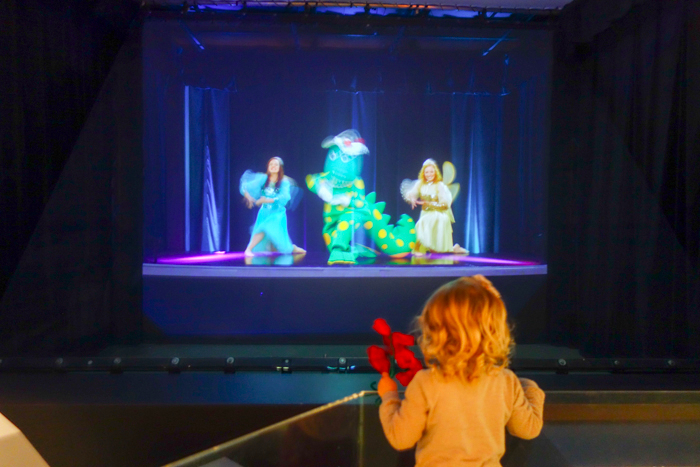 I guess it’s time for us to start watching The Wiggles! 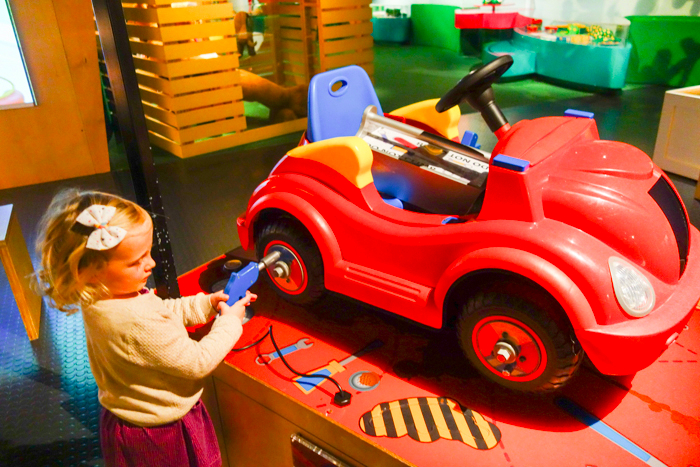 The last stop in the exhibit is the famous Wiggles red car, which kids can climb into and watch some Wiggles action on a screen in front of the car. 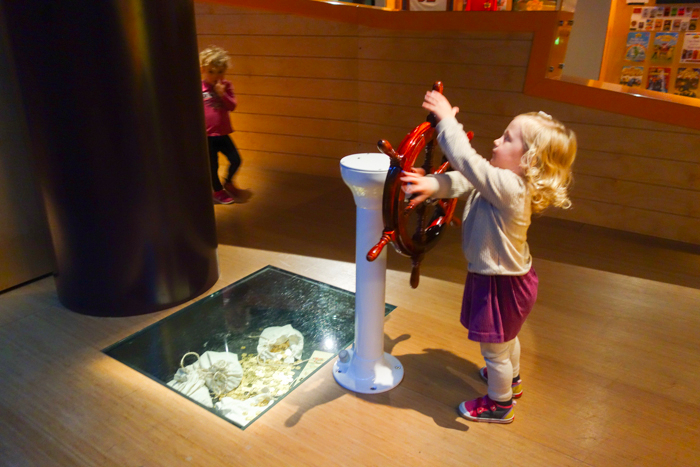 It’s a great photo op and was in hot demand when we visited. 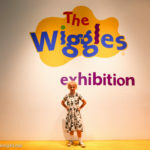 The Wiggles exhibition was a great cold weather outing. 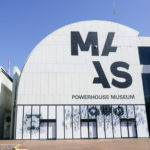 Entry to the Powerhouse Museum is $12 for adults and free for kids under four.